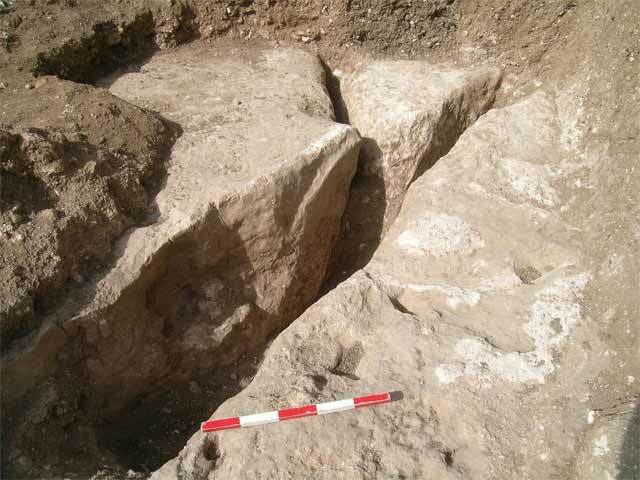 During May–June 2006, a trial excavation was conducted at the site (Permit No. A-4805; map ref. 21647/73491), prior to construction. 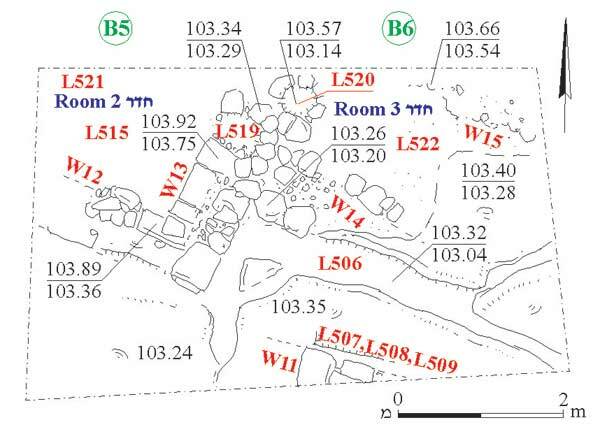 The excavation, undertaken on behalf of the Israel Antiquities Authority and underwritten by D. Simcha, was directed by Z. Daniel, with the assistance of V. Essman and V. Pirsky (surveying and drafting), A. Shapiro (GPS and geological consultation), H. Smithline (field photography), F. Abu Ziad (preliminary inspections), L. Kupershmidt (metallurgical laboratory), N. Getzov (pottery reading), H. Tahan (drawing), Y. Gorin-Rosen (glass), D.T. Ariel (numismatics), I. Ktalav (archaeomolucology) and laborers from Yafia‘. The site, which is located north of the town, on a steep slope close to Nahal Bet Lehem, is covered with refuse and poorly preserved. 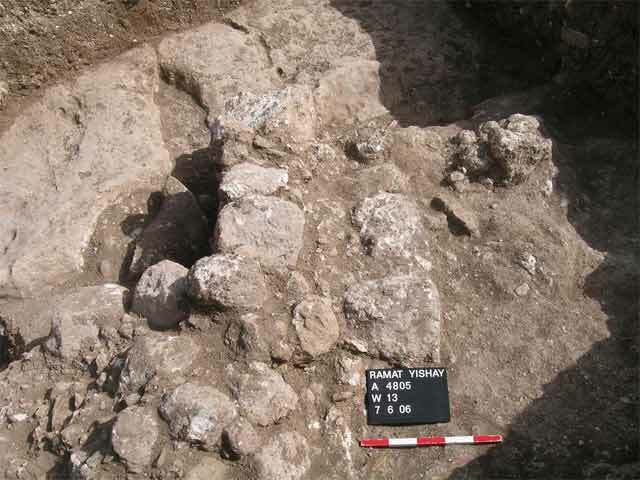 A burial cave from the Intermediate Bronze Age and habitation remains from the Roman to the Ottoman periods had been exposed to the southwest, within the precincts of the town (HA-ESI 119; HA-ESI 120). 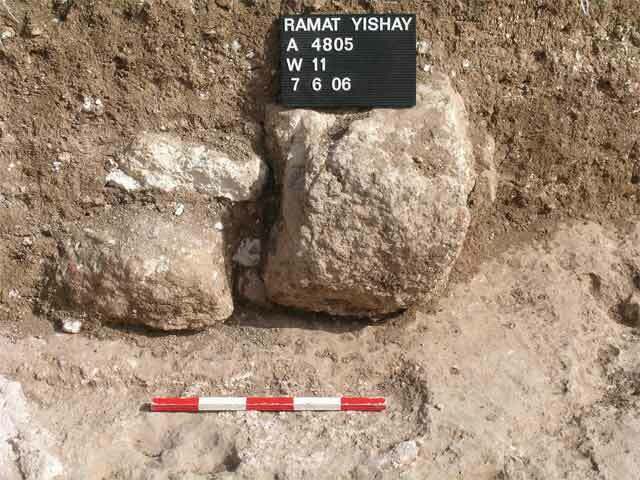 Two areas were opened in the east (Squares B1, B2) and the west (Squares B5, B6); building remains, probably of an agricultural installation that dated to the Byzantine period (fifth–sixth centuries CE), were exposed. It seems that the site is located on the fringes of the Byzantine settlement, located on the slope and next to the stream. Eastern Area. 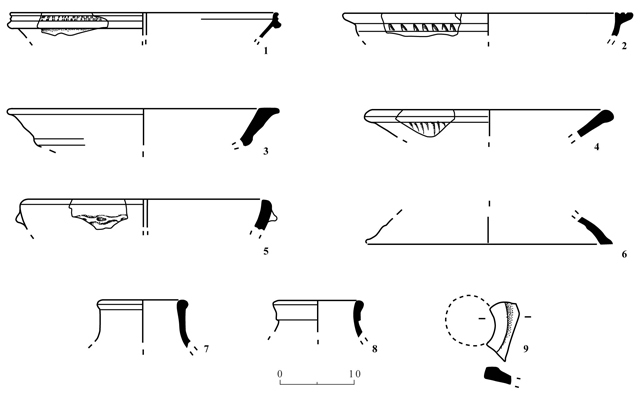 A section of a wall (W10; thickness 1 m; Fig. 1), oriented east–west, was exposed. The wall, built of roughly hewn chalk stones, was founded on tamped earth and some crushed chalk set on leveled bedrock (Fig. 2). An addition was built on the eastern part of W10 in a later phase. Fragments of glass vessels and Late Roman C bowls that dated to the Byzantine period (fifth–sixth centuries CE) were found around the wall. To the north and east of W10 were deep fissures in the bedrock (L512, L513; width 0.25–0.45 m, at least 1.8 m deep), which contained potsherds, dating to the Byzantine period. Western Area. 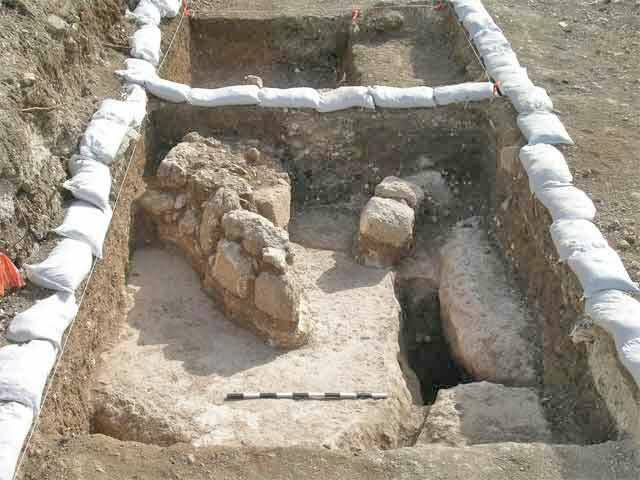 Remains of a building, which survived by two rooms, were discovered (Figs. 3, 4). The western room (2) was delimited by walls that were preserved a single course high in the south (W12—width 0.6 m, preserved height 0.45 m) and east (W13—width 0.65 m). The eastern room (3) was enclosed by walls in the north (W15) and south (W14). The floor beddings (L521, L522), which consisted of a tamped-earth layer, mixed with black ash and potsherds, were deposited on the chalk bedrock. Two circular built installations (L519, L520; Fig. 5) that probably postdated the building were discovered above W13. The installations, whose function is unclear, contained ash, a charred olive pit and unidentified organic material. A wall (W11; Fig. 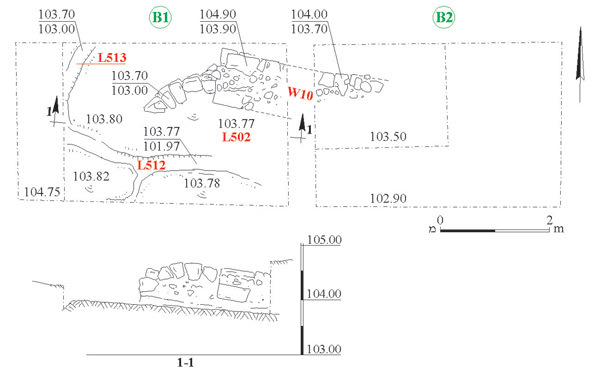 6), aligned east–west, was exposed next to the southern boundary of the excavation. It was built of two courses of dressed chalk and founded on leveled bedrock, similar to the construction in the eastern area. North of W11 were small hewn cup marks (L507–L509) and fissures in the bedrock (L506; Fig. 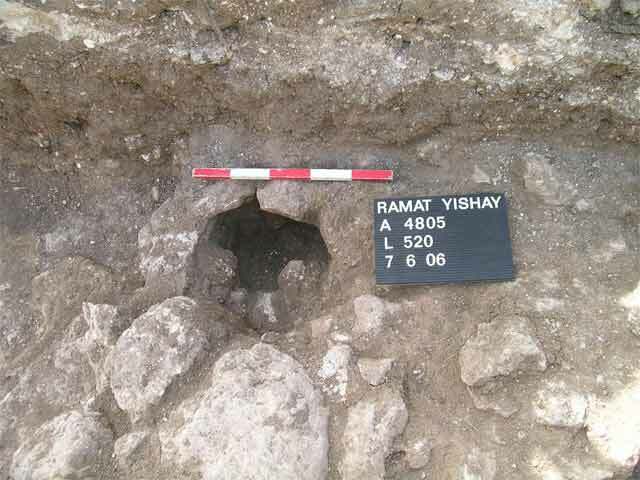 7) that were not excavated. Room 2 contained numerous fragments of jars, glass vessels, metal artifacts, tesserae, floral matter and a charred olive pit. The ceramic finds included Late Roman C bowls (Fig. 8:1–4), a krater (Fig. 8:5), a cooking-pot lid (Fig. 8:6), jars (Fig. 8:7, 8) and a lamp (Fig. 8:9) that dated to the Byzantine period (fifth–sixth centuries CE), as well as remains of a tabun. Most of the potsherds (c. 88%) were fragments of storage vessels. The thirty-four glass fragments included a bowl fragment with a beveled rim and a shallow engraved decoration on the side that dated to the fourth–fifth centuries CE and was discovered close to surface. Three copper flans were found, two on the floors of Rooms 2 and 3 and one in a bedrock fissure. These flans were probably un-minted but were used anyway as an alternative for coins in the second half of the fifth century CE and the first half of the sixth century CE (G. Bijovsky 2000–2002. The Currency of the Fifth Century C.E. in Palestine – Some Reflections in Light of the Numismatic Evidence. Israel Numismatic Journal 14:196–210). 1. The eastern area, plan and section. 2. Wall 10, looking west. 3. The western area, plan. 4. The western area, looking south. 5. Locus 520, looking north. 6. Wall 11, looking south. 7. Locus 506, looking east.